Mats add dimension, detail, and uniqueness to your framed artwork, significantly enhancing the beauty of the finished piece. All styles of your collage and custom photo benefit from using mats to add color contrast, dimension, repetition of theme, and unique decorative aspects. Mats can function simply as a border that helps even out an irregular shape, all the way to becoming an integral part of the art itself. There are endless options when designing mats, to include colors, textures, and finishes, along with how many to use as well as the number of openings and how they are shaped. At ART & FRAMING PLUS we use a computerized mat cutter that allows us to create truly unique designs! You are not limited to square, rectangular, or round shapes. We can easily create multiple openings for picture collages, custom openings with unique shapes, and embellishments such as lettering, debossing, and v-grooves. 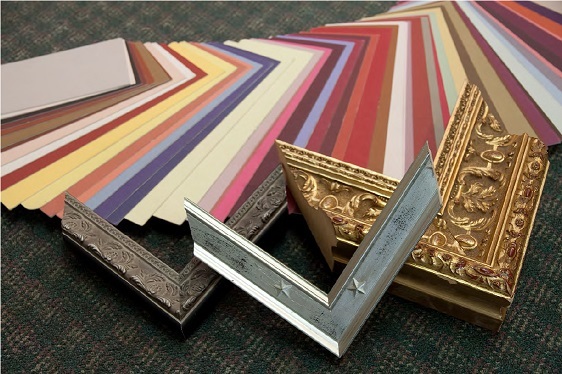 We offer our customers this customization of mats at no additional cost on all of our collage and custom photo framing projects. LIFETIME GUARANTEE ON MAT BOARDS!